To get started, open the Company menu and scroll down the list to highlight Set Up User Names and Passwords. On the slide-out menu, select Set Up Users. 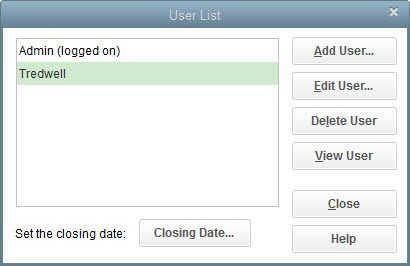 The User List window will open, and you should see your own entry as Admin. Click Add User. 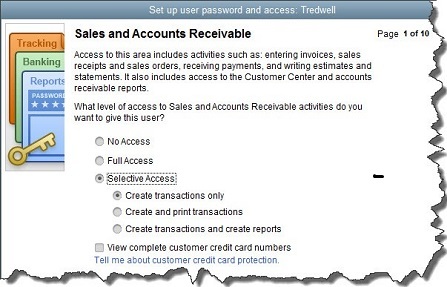 To give an employee access to QuickBooks, enter a User Name for him or her here, then a password. The Set up user password and access window will open. Fill in those fields and check the box in front of Add this user to my QuickBooks license. This will not be an option if you already have five users, since that’s the maximum number allowed by QuickBooks Pro and Premier. To buy more, open the Help menu and select Manage My License, then Buy Additional User License. External accountant (you can grant us access to all areas of the software except for those that contain sensitive customer data, like credit card numbers). You can specify the access rights for individual employees in numerous areas. Finally, you’ll tell QuickBooks whether this person can change or delete transactions in designated areas, and whether he or she can do so to transactions that were recorded before the closing date (if this applies). The last screen displays a summary of the access and activity rights you’ve given the employee. Check them carefully, and if they’re correct, click Finish. If you’re just now looking to add your first employee to QuickBooks or if you’re starting to outgrow the five-user limit, give us a call. There are more issues to consider when you take on multi-user access. We’d be happy to discuss them with you. To chauffeur day care attendees. To claim business use of your vehicle, use the actual expense method or the standard mileage rate. However, the actual method requires far more detailed records; you must keep track of your business miles and total miles to prorate the costs of fuel, insurance, repairs, etc. You will probably find the standard mileage rate to be far less complicated, as you only need to contemporaneously record your business miles and the purpose of each trip. Even with the standard method, you’ll still need to know the total miles driven for the year. For 2017, the rate is 53.5 cents per mile, down from 54.0 cents per mile in 2016. Capital Purchases – Capital items are those that normally last more than one year, including cribs and playground equipment. Be sure to keep receipts for these items, as they can generally be depreciated or expensed, whichever works best for you. Supplies and Business Expenses – The cost of items such as crayons, coloring books, paper plates, cups, cleaning supplies, and first aid supplies are also deductible in the year they are purchased. However, you need to keep receipts for all such purchases. Food – You can also deduct the actual cost of any food that is provided to the children in your care. It can be a bookkeeping nightmare to keep track of which grocery items were purchased for the childcare business and which were for personal consumption. Luckily, the government allows a care provider to deduct standard meal rates in lieu of actual amounts. This method does not require you to keep grocery receipts, and the IRS will not contest a food deduction based on the standard rates. The rates are the same throughout the contiguous U.S. states, with higher allowances for Alaska and Hawaii. Business Use of the Home – Generally, when a taxpayer claims a business deduction for the use of his or her home, the portion of the home that is used must be exclusively used for business purposes. Knowing that childcare providers do not use a specific space in the home 100 percent of the time, Congress added an exception related to the business’s licensing, certification, registration, or approval as a day care center or family/group care home under the provisions of any applicable state law. This exception applies only if the childcare owner or operator has applied for, been granted, or is exempt from such approval. In addition, the exception does not apply if the services performed are primarily educational or instructional in nature (e.g., musical instruction). However, the exception does apply if the services are primarily custodial, such that any educational, developmental or enrichment activities are only incidental to the custodial services. The services must be provided for adults age 65 or older, children, or other individuals who are physically or mentally incapable of caring for themselves. When calculating the percentage use of a home for business, there are two factors: the space used to operate the day care business and the amount of time that the space is used to provide day care, including preparation and cleaning time. There is also a simplified deduction method for the business use of a home; it may be useful for individuals who work from a home office, but it is generally unsuitable for a childcare business. The deduction for the business use of a home is limited to gross income from the business. If that limit applies to you, any home mortgage interest and property taxes that you have paid, as well as any casualty losses that you have incurred for the year, are always deductible when you itemize deductions, regardless of whether you claim a deduction for the business use of the home. If you have questions related to how any of these tax breaks apply to your childcare business, please give this office a call. If you are a parent, whether single, married or divorced, there are a significant number of tax benefits available to parents, including deductions, credits, filing status and exemptions that can help put a dent in your tax liability. Want your tax refund quicker? Don’t wait around for a paper check. Have your federal (and state, if applicable) tax refund deposited directly into your bank account. Selecting Direct Deposit is a secure and convenient way to get your money into your pocket more rapidly. Even for taxpayers whose refunds will be delayed until after February 15, because they have an earned income credit or additional child tax credit, Direct Deposit is the quickest way to obtain a refund. Speed – When combining e-file with direct deposit, the IRS will likely issue your refund in no more than 21 days. Security – Direct Deposit offers the most secure method of obtaining your refund. There is no check to lose. Each year, the U.S. Post Office returns thousands of refund checks to the IRS as undeliverable mail. Direct Deposit eliminates undeliverable mail and is also the best way to guard against having a tax refund check stolen. Easy – Simply provide this office with your bank routing number and account number when we prepare your return and you’ll receive your refund far more quickly than you would by check. Convenience – The money goes directly into your bank account. You won’t have to make a special trip to the bank to deposit the money yourself. Multiple Options – You can deposit your refund into up to three financial accounts that are in your name or your spouse’s name if it is a joint account. You can’t have part of the refund paid by paper check and part by Direct Deposit. With the split refund option, taxpayers can divide their refunds among as many as three checking or savings accounts at up to three different U.S. financial institutions. Check with your bank or other financial institution to make sure your Direct Deposit will be accepted. Deposit Can’t Be to a Third Party’s Bank Account – To protect taxpayers from scammers, Direct Deposit tax refunds can only be deposited into an account or accounts owned by the taxpayer. Therefore, only provide your own account information and not account information belonging to a third party. Fund Your IRA – You can even direct a refund into your IRA or myRA account. For more information regarding Direct Deposit of your tax refund and the split refund option, we would be happy to discuss your options with you at your tax appointment.